A Hero Fights A Demon. Or Persian Book Of Kings. 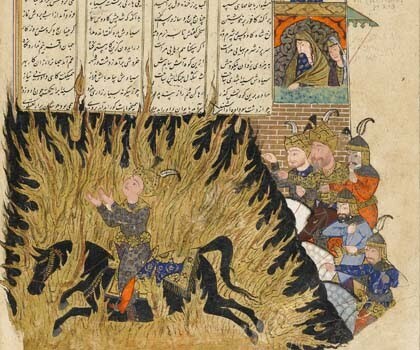 The Shahnameh, or " Persian Book of Kings," is the national epic of the Iranian people. The longest poem ever written by a single author, this chronicle of the reigns of fifty monarchs was completed exactly 1,000 years ago by the Persian poet Ferdowsi, who dedicated his life to crafting its 60,000 verses. Ferdowsi’s importance in Persian language and literature has been compared to that of Goethe for the Germans, of Pushkin for the Russians, or of Shakespeare for the English-speaking world. 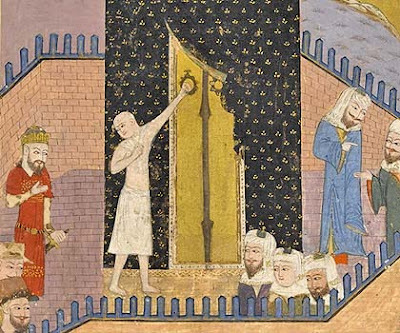 A new exhibit at the Fitzwilliam Museum at the University of Cambridge contains almost 100 illustrations from rare manuscript books spanning nearly eight centuries of this tale of myth, legend, and history. A Hero Endures A Trial By Fire. The exhibit, Epic of the Persian Kings: The Art of Ferdowsi's Shahnameh is the largest display of its kind ever shown in a British museum. 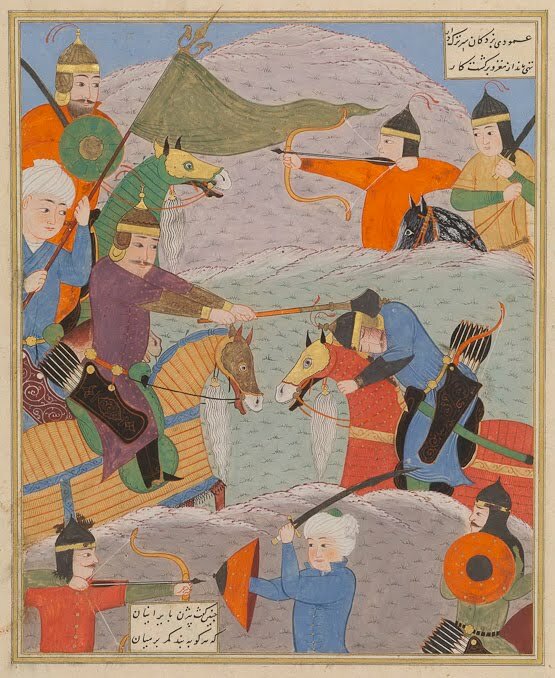 Artworks inspired by this poem, which tells the story of Persia from the beginning of time through the Arab conquest in the 7th century, have been gathered together from the British Museum, the Bodleian Library and the Royal Collection at Windsor Castle. 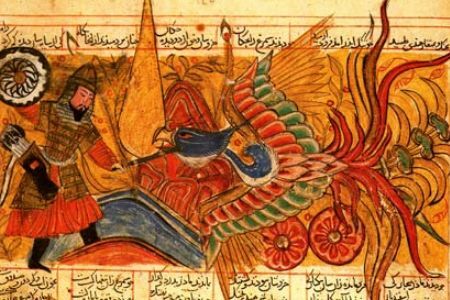 Timothy Potts, Director of the Fitzwilliam Museum, says: "It is impossible to overstate the significance of Ferdowsi's Book of Kings, which remains, a millennium after its completion, one of the most popular texts of secular poetry in Southwest Asia. 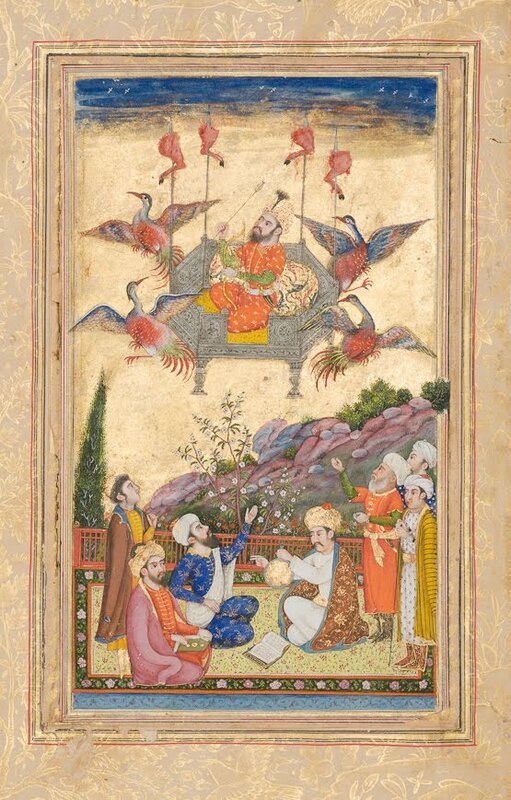 In its ambition, scope and spectacular range of displays, this exhibition at the Fitzwilliam is truly a landmark and for many visitors will be a revelatory introduction to the Shahnameh and its world." Is Bound By The Hero. During the thousand years since its completion, illustrated manuscripts of The Shahnameh have spread Persian culture from Egypt and Anatolia to India and Central Asia. The enormous popularity of its stories and characters, and their depiction by a wide range of artists in various media, allow the illustrated editions of The Shahnameh to become a microcosm for all of Persian art from the 12th until the 19th century. In early manuscripts the pictures are small and simple, fitting within the larger text. But over the years they increase in size and become much more elaborate, even including the use of decorative gold, lapis lazuli, and other precious pigments. The Shahnameh texts evolved into works similar to the heavily embellished illuminated manuscripts from the monasteries of Europe. 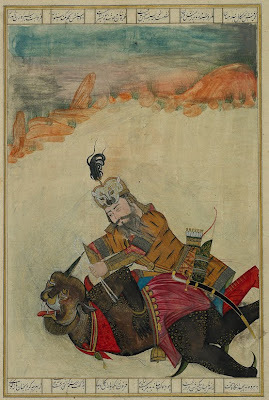 A Miniature Painting Inspired By The Shahnameh. Wealthy patrons commissioned manuscripts of greater and greater magnificence, each hoping to possess the most lavish edition of the epic ever created. 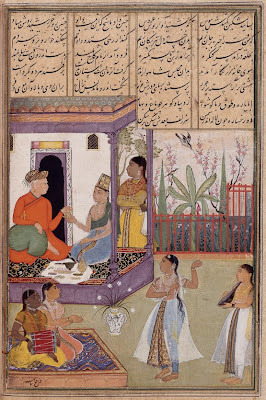 Splendid pictures often crowded out the text, and the artistic influence of China, India, and Central Asia could be seen in the the style of the illustrations. The earliest illustrations on show at the Fitzwilliam Museum are from the 1300's, and they continued to be produced until the mid-19th century. The tradition of hand-illustrating books in this painstaking way survived in Persia for nearly another three centuries after it ended in Europe. The Shahnameh was also the inspiration for thousands of miniature paintings, produced separately from any manuscript. These paintings were created by Persian, Arab, Turkish, Mongol, Kurdish, and Indian artists commissioned to recreate favorite scenes from the epic for the royalty and nobility. Aside from artistic value, one reason The Shahnameh remains so central to Iranian literature is because it was written in Persian rather than Arabic. Ferdowsi is widely regarded as the preserver of the Persian language and of pre-Islamic Iranian culture. Of all the peoples conquered by the Arabs in the 7th century, the Persians are the only ones who can boast a major literature in the indigenous language that they were using before the conquest, according to the Cambridge exhibit. 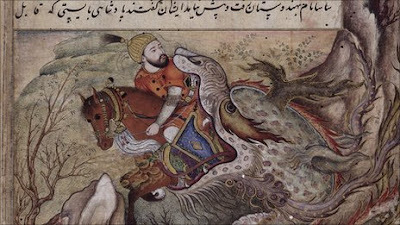 Unlike the English language of a work such as Beowulf, the Persian of Ferdowsi's poem changed very little over the centuries. The Persian reader needs no "translation" into modern language to fully understand the poem just as its original audience did. Ferdowsi went to great lengths to avoid using any words of Arabic origin. Children in Iran still study The Shahnameh in school, and many memorize portions of it in the same way that English speakers learn to recite passages from Shakespeare. A Dragon Devours An Unlucky Would-Be Slayer. Charles Melville, professor of Persian history at Cambridge, tells us that Ferdowsi was a wealthy landowner who spent at least 30 years writing his epic poem. It is a huge text, twice as long as the Iliad and the Odyssey put together. It explores not only the royal history of Persia, but also goes back to the days of mythic kings, who were slayers of dragons and demons. The work contains battle scenes and other heroics, but also romance and light-hearted games of polo. The exhibition curator, Barbara Brend, explains that there are three distinct sections of the work, "There's a legendary, mythical bit at the beginning then a middle section covering Alexander the Great. The last section deals with a real dynasty, the Sasanians." Each of the illustrations of The Shahnameh at the Fitzwilliam shows an event in the epic, whether a battle scene, the combat between a warrior and a fantastical creature, or a King courting his ladylove. By the time Ferdowsi finally got close to finishing his work, he was beginning to run short of money. 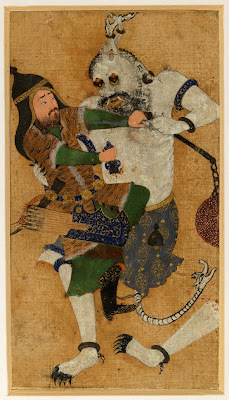 He presented his still unfinished epic to his patron, Mahmud of Ghazni, in hopes that the sultan would be pleased enough to advance him some cash. Sadly, things had changed since the work was begun: the pre-Islamic era was past, and a poem in Persian was viewed with suspicion. Professor Melville remarks, "He wasn't a court poet, a flatterer. And it's possible that he was suspected of Zoroastrian sympathies, the pre-Islamic religion. So he wasn't accepted by the religious authorities either." Ferdowsi died in 1020, fearing his poem was a failure. Fitzwilliam Museum director Timothy Potts says Ferdowsi’s words were initially greeted with hostility, "His poem was to be a paean to a Persian past that struggled to maintain itself against Arab, Turkish and other peoples and ways of life." A Battle Scene Between Rival Factions. The Shahnameh went virtually underground for nearly 200 years after its completion, with only a few brief quotations and references to the work in existence. By the 13th century the epic had begun to return to favor, although copies of the text made 200 years after Ferdowsi's death undoubtedly contain both errors and "improvements." According to the Cambridge Museum, only three manuscripts are known to have survived from before the end of the 13th century: an incomplete copy of 1217, a full text of 1276 and a third, undated copy from this period. None of these is illustrated. Near The End Of The Persian Epic. "Ferdowsi’s Shahnameh has been the wellspring of Persian culture for the past thousand years," says Timothy Potts. "Other cultures have their literary icons – Homer for the ancient Greeks, Shakespeare for the English, Dante for the Italians. But none of these exercised quite the defining influence on so many levels of culture and identity up to the present day as The Shahnameh did for the Persians." Epic of the Persian Kings: The Art of Ferdowsi's Shahnameh exhibition at the Fitzwilliam Museum in Cambridge will be on display through January of 2011. Highlights of the show are also available in an excellent virtual exhibit on the museum's website.